Photos provided by Barb Heiss on this page - thank you! And by Eileen Wolfberg (last pic on page)! 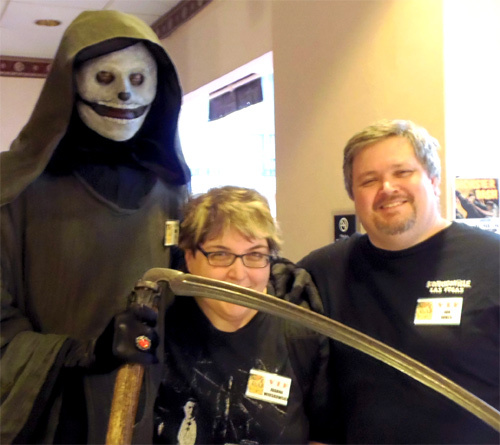 Three great people: Pittsburgh TV Horror Host icon "Chilly Billy" Cardille, Monster Basher Barb Heiss and NIGHT OF THE LIVING DEAD's Kyra Schon! 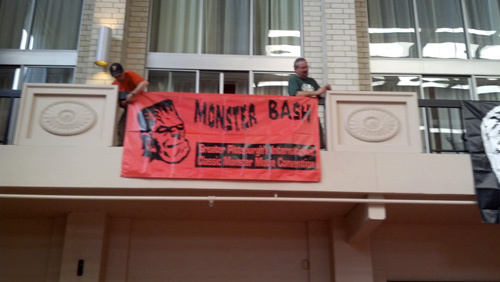 Ron Adams and Bob Pellegrino get a Monster Bash banner up on an interior lobby balcony pre-Bash on Wednesday. 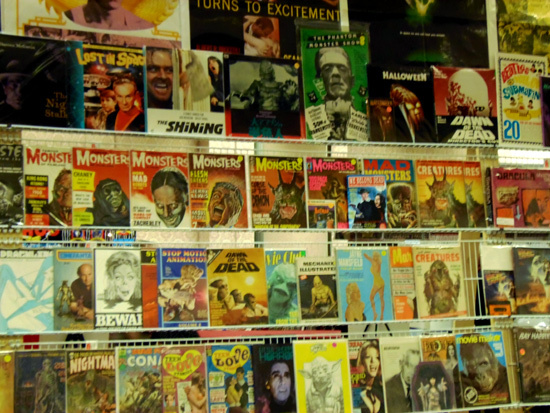 More set-up with monitor and Wolf Man banner. 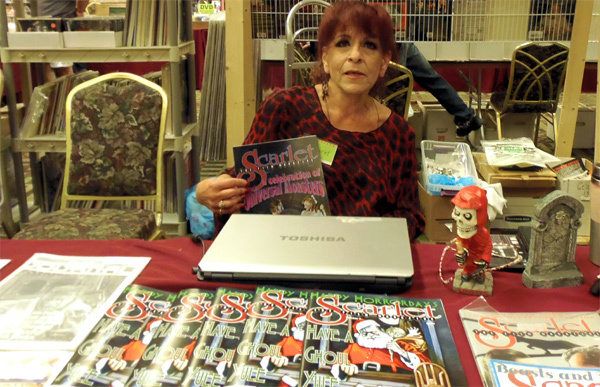 Arlene displayes the latest issues of SCARLT - THE FILM MAGAZINE in the Monster Bash Dealer Ballroom. 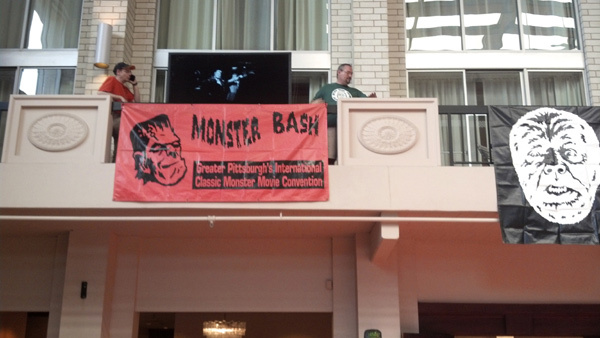 Monsters Among Us set-up in the Monster Bash Dealer Ballroom.....see anthing you want in there, it's all great! 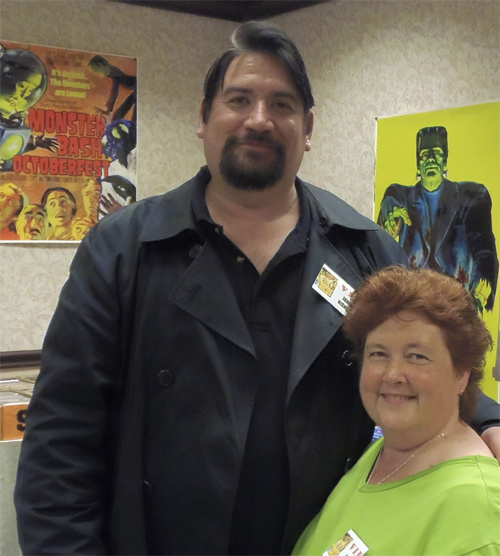 Ria and Michael from MONSTERS AMONG US! 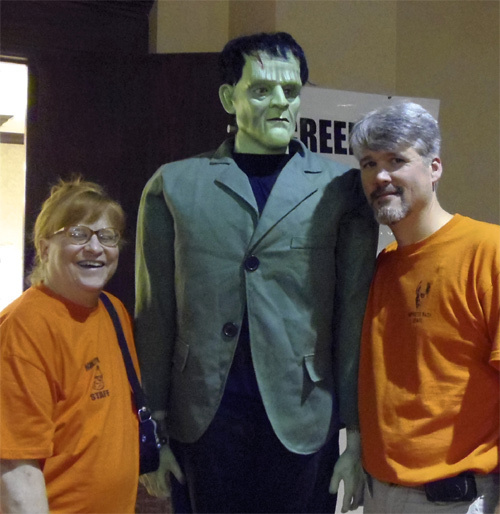 Debbie, Frank and Jon Doerr. 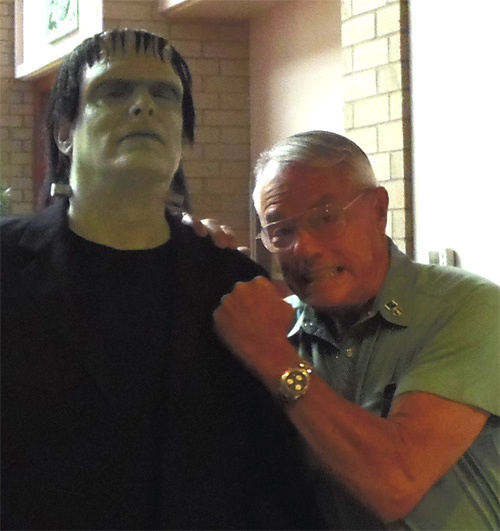 Donnie Dunagan (right) meets up with an old friendly giant in the lobby. 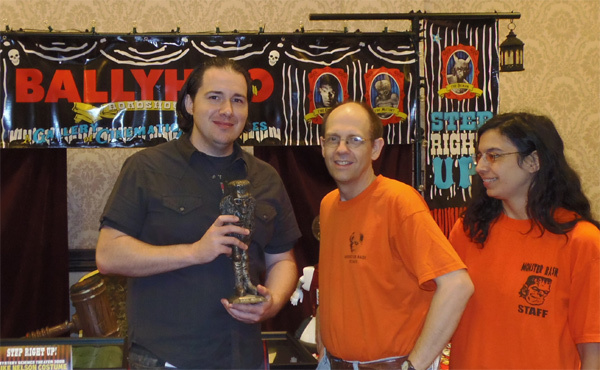 Daniel Griffith of Ballyhoo Productions gets his Monster Bash Award for his outstanding work in preserving classic movies with outstanding documentaries. 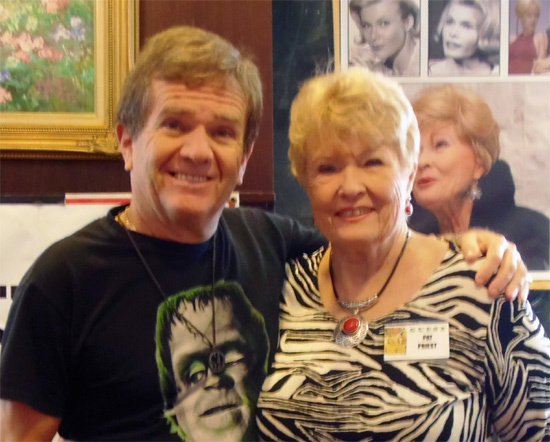 The family reunion....Eddie and Marilyn Munster at Monster Bash! 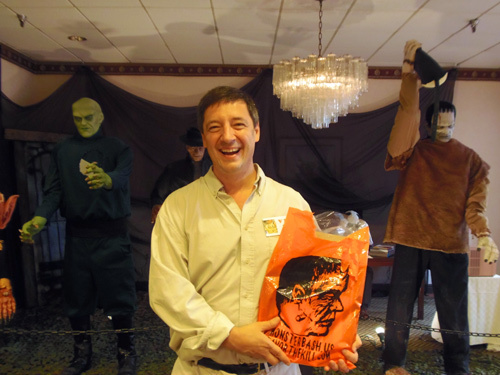 Zach Zito display his bag of goodies with a smile! 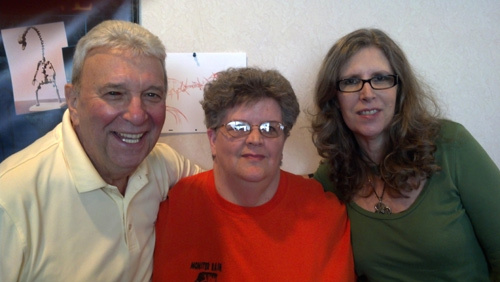 John and Mary Bishop, good people, good times! 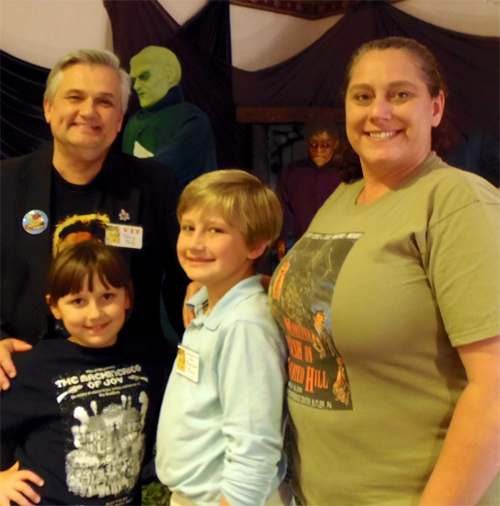 The Moehring family in the Monster Bash Event Room. 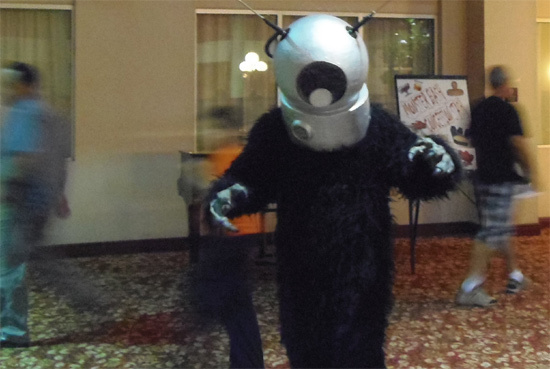 Lobby Security for Monster Bash - Ro-man! 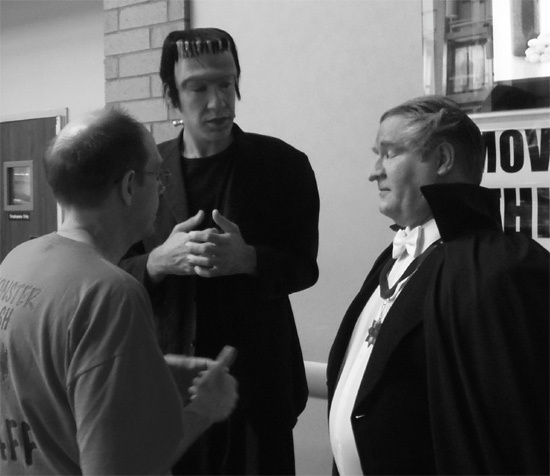 Planning a surprise reunion on stage for Butch Patricl and Pat Priest....pictured here, Ron Adams, Thom Shubila as Herman and Ted Lewczyk as Grandpa. Make-up by John Tatarelli and Reel Magik. "Hey guys....it's still not straight." 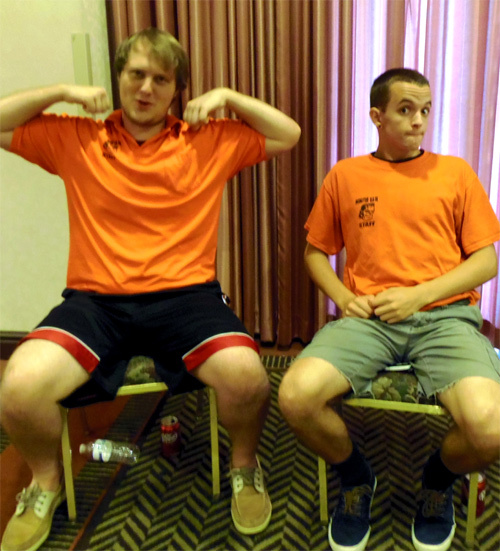 The super set-up experts Connor and Justin...really super Monster Bash staffers that go the extra mile EVERY time. 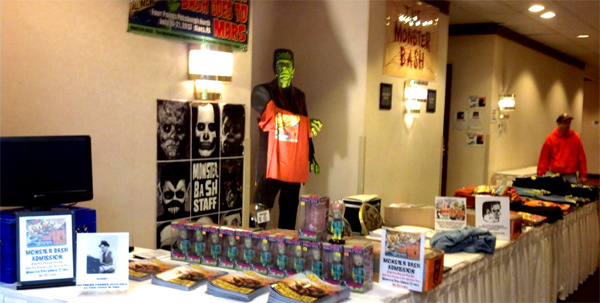 The Monster Bash Registration area, set-up early on Thursday and ready to get set-GO! Ursula Adams and Theron Statler setting up Thursday morning. 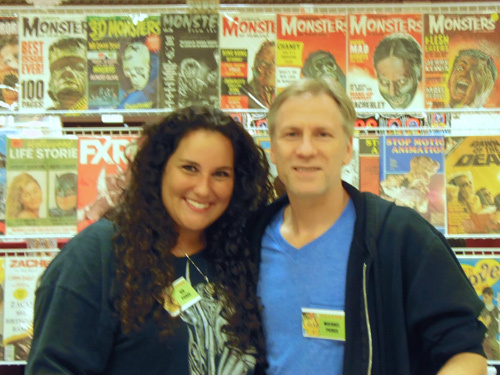 Cable TV had THE SOPRANOS....but, Monster Bash has THE COLES! Joe and Joe, Jr. are the Guests of Honor Team that treats them so well. Bravo to The Coles. 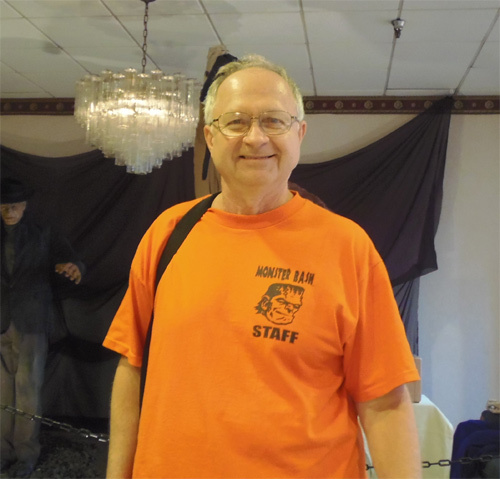 It's all smiles as Monster Bash is under way....Monster Bash staffer Bob Kennedy is ready to Bash. 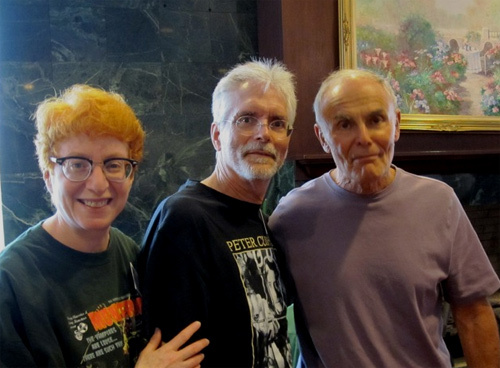 Classic monster fans through and through: Theron Statler, Bob Pellegrino, Mark Statler, Ed Watson and the new super hero on the far right - "The Blur" as portrayed by Mike Adams. The super great Terry Pace Family....with Forrest in the middle....I bet you know who he was named after! 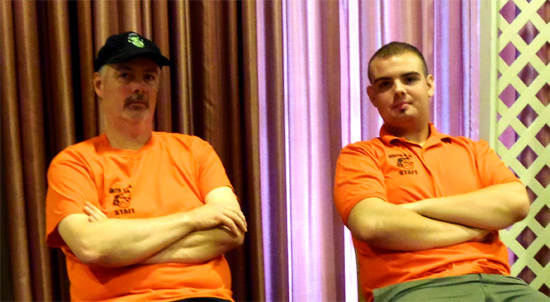 The always serious security squadron of Connor and Justin! Don't mess around with these "tough guys!" 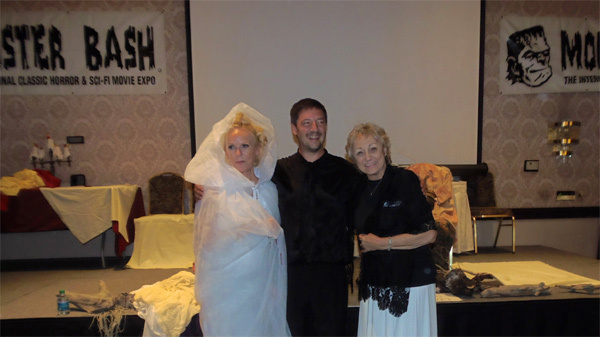 Live Theatre at Monster Bash with Veronica Carlson, Zach Zito and Janet Ann Gallow in THE FALL OF THE HOUSE OF USHER! Eileen Wolfberg, Tom Jackson and John Saxon....ready for action!